Since i was a child i was always very interested in cars, my father, JOSEF J. SCHMITZ, and i watched formula one ( we were big fans of Senna racing the black “John Player Special” Lotus and that is the reason why i choose my initianls in gold on black for the logo of my webpage ) and touring car races since the early 70th and my father supported me in my interest in sports cars from the beginning. My “first love” in automobiles was ALFA ROMEO and i have spent some very nice years in a BERTONE 1750 GT and several Pinin Farina SPIDER convertibles before, relativly quickly, i found my way to the PORSCHE brand and especially the 911. At the age of 21 i bought my first 911 Porsche, a 2.7 SC which was my very first real contact with this CULT CAR. The 2.7 SC was followed by some 911 3.2 convertibles, a 911 3.2 widebody supersport convertible and a 911 Turbo 1- 3.3. In 1996, when i was already in the car business after i had sold my fashion company, i bought myself my very first 964 RS. Since then my love for this model and its “relatives” the other Porsche lightweight cars just grows and grows. On the road and on track these cars are the ultimate driving pleasure and big fun – pure driving, light cars and not loaded with option gimicks which nobody needs, this is the key to real Porsche pleasure for me. Just a pure and realy simple Sport-Porsche !!! As a logical consequence to my love and interest for these special lightweight cars i decided to make it the central idea of my car business. i guess my “virus” for RS cars jumped over to many of my customers during the years. Since 1996 i have sold more than 450 – 500 of the 964 RS as well as surely about 250 of the even rarer 993 RS as well as about 25 of the only 172 produced 993 GT 2 cars. Beside this i sold many 964 Turbo 3.6 and several of the ultra rare 964 Turbo “S” lightweigt and quite a big number of 964 and 993 Cup cars. I think only the porsche factory has sold more of these cars than me and i must say that i am a little bit proud of this fact. Many of these cars went to customers and enthusiasts all over the world and to Porsche club members all over the world – besides Germany especially to Great Britain, Japan, France, Italy, Belgium, Holland, Sweden, Switzerland, Ireland as well as the USA, South Africa, Ukraine. I am very happy about the fact that many customers became close friends over the years and that i still have good and friendly contact with almost all of my clients. It is just nice to see that the hobby ” Porsche” can bring people together, no matter what country they are from. Even since the water cooled and more powerfull porsche sports cars like 996 GT 3 and 996 GT2 as well as 997 GT 3 and 997 GT 3 RS are available i always focused on the aircooled lightweight models 964 and 993. I of cause sold several 996 GT3 and GT 2 as well as 997 GT 3 and GT3RS and will do in the future but the aircooled is were my heart is. 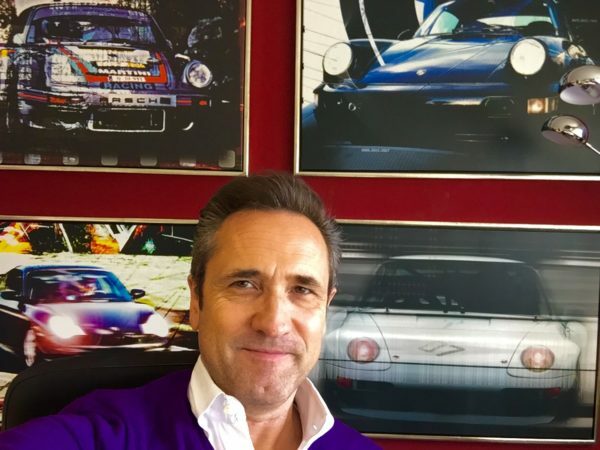 Owning sportscars and dealing in sportscars means to me as well driving them as the porsche engineers ment to drive them – sportive and fast !!! What car is better for use on track than a Porsche lightweight ! Hobby driving, driver schools, track days or even club racing – the Porsche RS or GT is the ultimate solution !!! I can only adivse every porsche fan to find his own “playground” – collecting cars for the collectors mentality, driving sportive for the porsche fan and track or race for the racer in you. Best is you do a bit of all and realy enjoy it. I do !!! There are maybe many other sportive cars in the market, older and younger, but none of them is as pure, as honest and as much fun to drive as an RS or another Porsche lightweight model. In combination with very good reliability, extremly high quality and bullet proof technics as well as always rising value and extremly good to resell this cars are outstanding. In the sum of all its attributes the Porsche is lightyears ahead of most of its competitors. Looking at these facts a Porsche does not only have to be a passion but can as well be a very economical decison. Next Next post: Porsche 911 – 993 RS, Clubsport / RSR spoiler kit, painted midnight blue met.